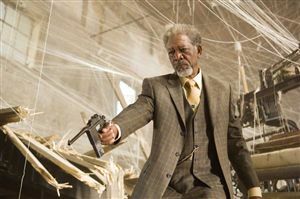 Cast: James McAvoy, Angelina Jolie, Morgan Freeman, Marc Warren, Terence Stamp. Story: Office flunky turns assassin. Well at least the trailer was representative. Wanted has to be the most ludicrous movie ever made. I'm sure you remember the Transporter movies. They were utterly ridiculous but very watchable - as long as you could latch into their sense of fun. With Wanted, the sense of fun isn't really there, but the brazenness of the action sequence is notched up even further - explained away by the characters' ability to "slow things down" in their minds. After the opening sequence you know you're going to have to suspend all disbelief, but whenever you do, there's an ever-more outlandish stunt around the next corner to make you chuckle even more. So it came as a huge surprise to me when I found myself actually quite gripped towards the end, genuinely caught up in the moment. That doesn't usually happen. 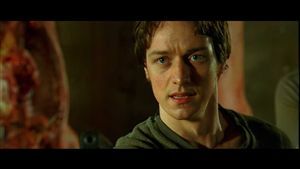 James McAvoy hasn't done the action thing before, but you'll recognise him from his previous roles, such as Mr Tumnus in Narnia and the idealistic doctor in The Last King of Scotland. He's always been good value and continues his run of form as a browbeaten office jockey head-hunted by a fraternity of assassins led by Morgan Freeman and Angelina Jolie. Several beatings and a training montage later, we have a new action hero on our hands - who'd have thought it? Headlining his arsenal of new tricks is the ability to "curve the bullet" - not just in a wide arc, but apparently to make it go in right-angles around corners and even go full-circle (sigh). But of course JFK conspirators have known about that for ages. Wanted is Russian director Timur Bekmambetov's first English language movie after making an international name for himself with the stylish and unusual Night Watch trilogy. I can't say he's quite as off-beat here, but we're certainly treated to a visual feast. We don't just see a baddie get shot in the back of the head, we see the bullet bursting out of his forehead in slo-mo. It needs these visuals to be breathtaking, because if you start thinking about what's going on, it won't make any sense at all. The final reel is full of stupid happenings - not just silly actiony bits, which I'm OK with because of the context, but asinine plot points that could've been written better by your average hobo. Wanted is a fast-paced, all-action thriller that takes implausibility to new levels. It's great to look at and goes no further - it's a music video without the music. Testosterone Satisfaction Rating: 4/5 - Just a hint of Mrs Pitt's arse but lots of high-octane tomfoolery to make up for the tease. To enjoy this film you should be: OK with supreme preposterousness. Wanted was released in the UK on 25th June 2008.